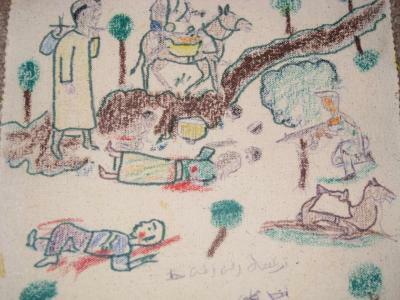 A friend just too k digital pictures of panels we have with drawings by Darfuri refugee children. This is a batch of 26 panels, from the many dozens that we took with us to the Chad-Darfur border. We handed them out to kids at the camps and gave them some markers, with no other instructions. I went through everyone of these 26, renaming the files with the name of the child and their ages. These drawings are very unlike what our own children would draw. I remember visiting some children at an elementary school that were sending messages to refugee childr en, and they were writing little notes and drawing on the theme of “home,” what they see in their mind when they think of home. The drawings included their toys in their rooms, their families at gatherings, the parks in their neighborhoods, and even some of the places they enjoy, such as McDonalds and Target. 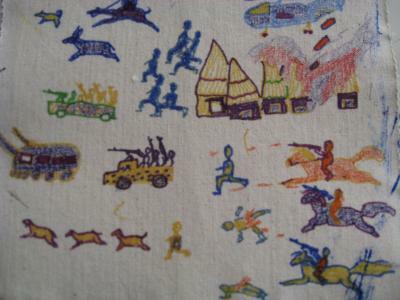 The kids in the camps draw fire, weapons, helicopters, bombs, and injured friends and family. They tell the story of the last day they saw their homes, before they were burnt to the ground. Some show their journey away from the violence, or so they thought, and the first time they see their new home, tents in the desert. On the walk to the border, janjaweed lay hidden in wadis (the usually dry river-beds, where they dig for drinking water) and ambushed the fleeing families, killing some, injuring and terrorizing others. Just days ago we received another type of illustration, a map by the U.S. Department of State. 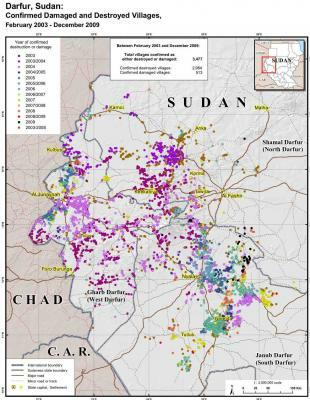 It shows Darfur with dots of all colors, filling areas all over the map. Visually, the map is plain and cold, as most government produced reports are. If you read what the dots represents, all 3,477 dots, the cold map becomes a punch to the gut to anyone that knows the connection this information has to the colorful kids’ drawings. Each of the 3,477 dot was a village that has been attacked, most of them completely burnt to the grown. Our kid artists used to live in these villages, which are now dots on a map.